We’ve been back from France for a week now but to be honest, although my body may be home I think I might have left my brain back in the Dordogne somewhere. It’s taking me a little while to get back into the swing and routine of normal life. Which I guess is the sign of a good holiday. We ate well in France and so I have returned home both round and brown. You can’t really spend time in France and not take advantage of the good food now, can you? We ate out quite a lot and when we cooked for ourselves we generally kept things pretty simple with gorgeous barbecues and delicious salads. When you’re on holiday, you don’t want to spend all your time over a hot stove – far better to be sat by the pool with a cold beer and a good book. But I can’t go a whole fortnight without wanting to play around in the kitchen. One of our first meals was the fabulous Elizabeth David classic, poulet a l’estragon, and another dish I simply had to try my hand at was the French upside-down favourite, tarte tatin. 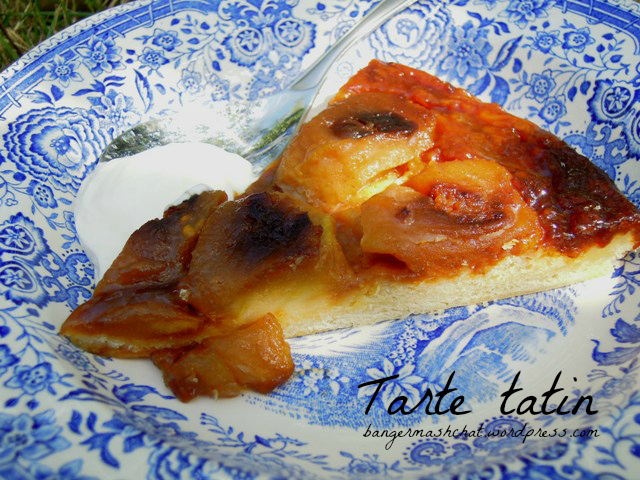 I’ve wanted to make tarte tatin for a long time but somehow have never quite got around to it. And as our house was surrounded by apple trees absolutely heaving with fruit, it seemed the obvious thing to make. The only slight problem was that our kitchen wasn’t the best equipped; only after buying all the ingredients did I discover there weren’t any weighing scales or a rolling pin. So I had to improvise with an empty wine bottle and by googling conversions for grammes to tablespoons. But I got there in the end. When my daughters came in from the pool to see what I was up to, I was clearly having so much fun baking they just had to join in. 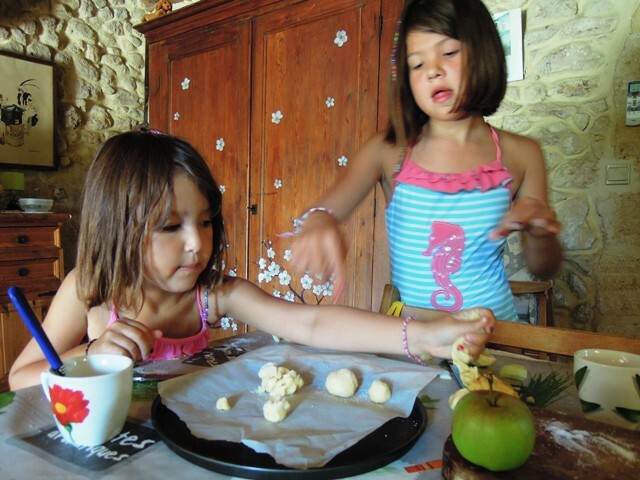 They created their own little delicacies from the leftover pastry and apple pieces, which they left out that night to feed the fairies. I used Nigella Lawson’s tarte tatin recipe from How to be a Domestic Goddess. It’s not a particularly authentic recipe as it uses Danish pastry, which you’ll need to make up the day before, but I think it worked really well and it got a big thumbs up from the rest of the family, and if you’ve got the right equipment it’s not all that difficult either. Start by making the Danish pastry. Nigella makes hers in a food processor but as I didn’t have one available, I made mine by hand. Pour the water and milk into a jug and add the egg and beat together with a fork. In a large bowl, place the flour, yeast, salt and mix together. Add the pieces of butter, mix again and then add the contents of the jug. Use your hands to combine everything, until you have a gooey, lumpy mess. Don’t worry – it’s supposed to look like this. Cover the bowl with clingfilm and leave in the fridge overnight. When you’re ready to make the pastry, remove the goo from the fridge and let it come to room temperature before rolling it out to a square 50cm by 50cm. At this stage I discovered my mixture was still incredibly wet and so I had to add quite a bit more flour before I could handle it. I assume this problem was down to my lack of weighing scales. Fold the dough square into thirds, like (as Nigella puts it) a business letter. Turn it so that the closed fold is on the left. Roll it out again to a 50cm square, and then repeat this three more times. Cut the pastry in half and wrap in clingfilm, and leave in the fridge for half an hour before using. The tarte tatin only uses one half of the pastry, so use the other half for something else. I used mine for plum Danish pastries – I’ll post the recipe for this soon. Preheat the oven to 200°C/Gas Mark 6. Pop in a baking sheet to warm up. Put the butter in a tarte tatin dish or a heavy ovenproof frying pan on the hob and melt the butter. Add the sugar. When it starts to foam add the apple quarters and arrange them in a circular pattern, curved side down. Cook on a fairly high heat until the buttery juices turn a beautiful golden colour and the apple begins to soften. Remove the pan from the heat and leave to cool a little for 10 minutes. Roll out the pastry into a thin circle slightly larger than the pan. Lay it on top of the apples and tuck the edges down the sides under the apples. Place the pan on the baking sheet in the oven and cook for 20 to 30 minutes, until the pastry is golden brown and the caramel syrup is bubbling. Place a large plate on top of the pan and with great care (and wearing oven gloves) turn the pan and plate upside down. Remove the pan to reveal your beautiful tart. OK, so probably a few pieces of apple will probably have stuck to the pan, but that’s not a problem – just pop them back into place. Slice and serve with a large dollop of creme fraiche. As the pastry uses milk, eggs and flour, this tarte tatin is my entry into this month’s Recipes for Life challenge, which I have been hosting on behalf of the charity SWALLOW. 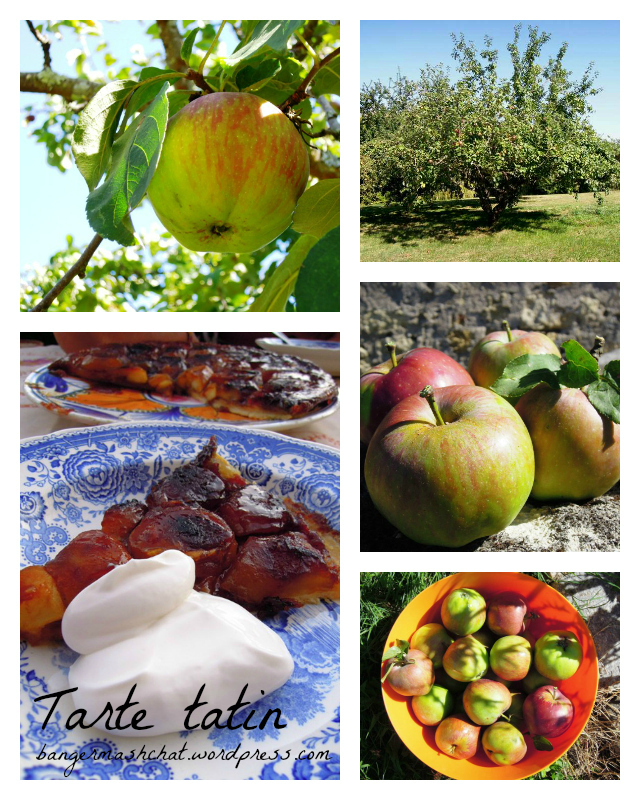 And as tarte tatin is a classic French summer pud, I’m also entering it into the fabulous new Four Seasons Food challenge, hosted by Delicieux and Chez Foti, where the theme for August is Summer Puds. I am also entering it into Tea Time Treats hosted by The Hedge Combers and Lavender & Lovage, where the theme for January 2014 is Eggs. I love that your girls joined in with the baking! Holiday kitchens can be frustrating if you’re wanting to cook, but the wine bottle rolling pin is always a good standby – we used one to make fresh pasta while we were away this summer. I’m looking forward to using your recipe with some of the apples from our tree. Looks delicious and I love little helping hands in the kitchen. Thanks Nayna! It really was good and I look forward to making it again now we’re back home and actually have scales I can use, plus our own apples from the garden too! I love it when the kids want to get involved in the kitchen. My youngest in particular enjoyed licking the caramel-covered spoons afterwards! My daughter has just been picking apples today at her Granny’s so think I may have to give this a go. 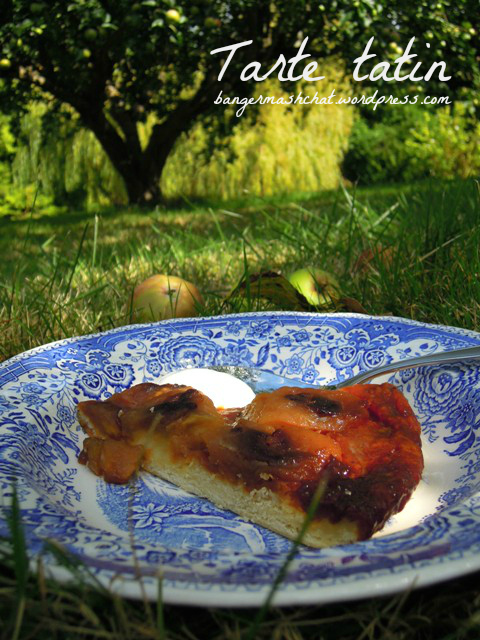 The apples trees look wonderful, can see how you couldn’t resist baking a classic French pud with them. And agree with Sarah, I bet the wine bottle improvisation and your girls joining in made it all the more delicious. With all the yummy apples now around this would be fab. I think mini chefs would love to help make this. Thank you SO much for linking up such a yummy recipe in my first ever tea Time Treats challenge Vanesther! It looks mouth watering!